Iron Pours and Ideas – What Could They Possibly Have in Common? Iron pours and pit-fired pottery. I had absolutely no idea what this meant, but there it was, right in front of me. The magazine ad said I could experience this at the Midwest Fire Fest. I’m in! I LOVE new adventures, so this was right up my alley. My husband and I jumped in our car and headed to Cambridge, Wisconsin. Never heard of this town? I’m not surprised since it only has a population of 1,457. But there they were – hosting this Fire Fest that totally intrigued me. Not even the steamy temperature or the threatening storms could keep us away. 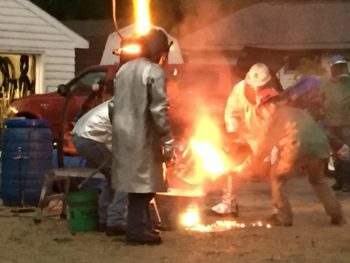 Standing outside, we watched men and women dressed in fire protective gear throwing chunks of iron into this huge caldron, sparks flying everywhere. When the iron was so hot that it melted, they actually used large ladles to pour the hot iron into small sand molds previously designed by people attending the festival. Do you see a similarity here? Think about your ideas and your dreams. They start out in huge chunks, just like the iron. They are unshaped and in raw form. As you begin to move forward, fitting the pieces of your idea together, sparks begin to fly. You get excited, ecstatic and emotional as those pieces begin to mold into one form, one shape, one final idea. Wearing the proper “fire protective gear” is essential so you can tune out all the naysayers and keep moving forward, no matter how many people may tell you “it’s just not possible”. As I move forward in life, creating and molding my own ideas and my own dreams, I was moved by the words of Flavia Weedn: “If one dream should fall and break into a thousand pieces, never be afraid to pick one of those pieces up and begin again”. When your idea, your dream, is finally realized, those around you will be amazed by your tenacity. Many times, you even amaze yourself; seeing your sparks fly everywhere. I think you can take those words from Flavia Weedn one step further – Pick up those broken pieces and put them back in the fire, let them melt, making sure you stir them thoroughly so that there is no trace left of what was broken – what made the dream is still there, just the fact that it was broken is removed – and then pour into a new mold for a new dream. I LOVE that concept. Just never forget the “lessons” you learned from that broken dream. They make you the person you are today.